What exactly are probiotics, and do I need them? Not to be confused with prebiotic (which are the dietary fibres that feed friendly bacteria already in the gut), Probiotics are microorganism that provide health benefits when we consume them. Probiotics are foods, or supplements that contain friendly bacteria that help to colonize our gut health with health boosting microorganisms. Gut health is no joke and is one of the single most important things you can do to maintain optimal health. You’ve likely heard it before, everything starts in the gut, so optimal gut health should be a priority for everyone. There lies a complex community of microorganisms in your gut called the gut flora and your gut contains hundreds of different types of microorganisms, with some numbers as high as 1000. This includes bacteria, yeasts and viruses. The larger majority is bacteria. Most of the gut flora is found in the colon, or large intestine, the last part of the digestive tract. The gut flora performs many functions that are important for health. It manufactures vitamins, including vitamin K and some of the B vitamins. Additionally, gut flora turns fibers into short-chain fats like butyrate, propionate and acetate, which feed the gut wall and perform many important metabolic functions. Microorganisms also stimulate the immune system and regulate the integrity of the gut preventing unwanted substances from "leaking" into the body. The gut flora is highly sensitive to modern insults, and studies show that an "unbalanced" gut flora is linked to numerous diseases, including obesity, type 2 diabetes, metabolic syndrome, heart disease, colorectal cancer, Alzheimer's, depression and the list goes on. Probiotics (and prebiotic fibers) can help correct this balance, making sure that our gut is working optimally. Where do probiotics come from? As mentioned, probiotics are microorganisms, which means they are living and generally found in foods that are prepared by bacterial fermentation like yogurts, kefir, sauerkraut, tempeh to name a few or you can get them in the form of supplements. Interestingly, different probiotics work for different health conditions, needs, gender and overall physiology. Therefore, choosing the right type (or types) of probiotic is essential. Many probiotic supplements combine different species together in the same supplement. These are known as broad-spectrum probiotics, or multi-probiotics. Here are a few examples of Dr. Formulated varieties of probiotics for different health conditions or phases of life. Designed by Dr. David Perlmutter for Garden of Life, who is an expert in the human microbiome, a board-certified neurologist, Fellow of the American College of Nutrition, and America’s brain-health expert. 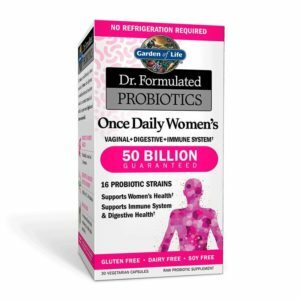 These probiotics are designed especially for women, keeping in mind women’s unique physiology. Contains 50 billion CFU:16 raw probiotic strains, Added L.reuteri and L. fermentation probiotics. The high probiotic count is designed to optimize digestive and immune health while supporting vaginal health. 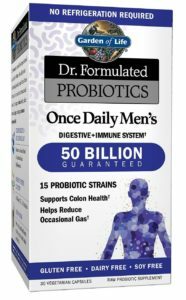 This strain of men’s daily is made from high counts of probiotics, 50 billion CFU, 15 probiotic strains and a diverse blend of Lactobacilli and Bifidobacteria which supports Immune functions, colon health and are resistant to stomach acids and reduces occasional gas. Critical Care probiotic formula is designed with high potency and is specific to aid with colon and immune health. 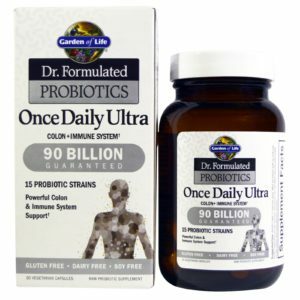 With 90 billion CFU and 15 probiotic strains critical care can be used to balance digestive health, including frequent constipation. Follow up with a once a day probiotic to keep digestive health in check. 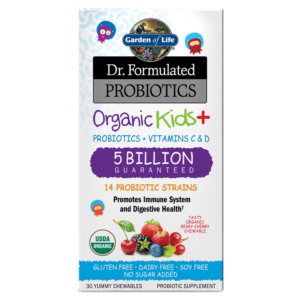 With 5 billion CFU, 14 probiotic strains, including added vitamin C and D as well as prebiotic fiber to help maintain digestive health and support strong immune health. The no sugar, or preservatives added, in addition to chewable and tasty are the perfect addition to children’s daily routine aiding in the often-fluctuating diet of children. Previous article Warm up with the easiest elixir recipe ever!